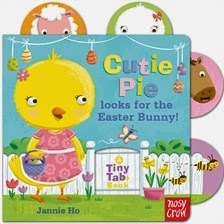 Home » Anastasia Gonis » Animals » Board Books » Easter » Reviews » Reviews by Anastasia » Review: Cutie Pie looks for the Easter Bunny! Review: Cutie Pie looks for the Easter Bunny! Cutie Pie the chick is looking for the Easter Bunny. Doggy, Squirrel, Horsey and Owl along with all the other farm animals have their eggs and Cutie Pie is anxious to get hers. She searches everywhere. Will she find the Easter Bunny’s basket of eggs? Part of the Tiny Tab Book series for the very young, this chunky and durable Easter book is ideal for toddlers’ clutching hands. Its pull out tabs reveal hidden pictures of animals on both sides of the cut away shape. This learning experience is a game of hide and seek, search, find and name, and has surprises to be discovered within each delightful and expressive full page colour illustration.